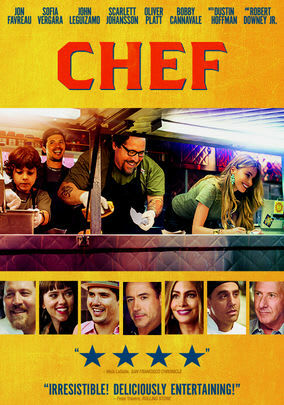 My wife and I sat down the other night to watch Chef (which was actually the last in a long line (count 'em....three) movies that we tented to watch over my holiday vacation) and the results were rather surprising. Now, mind you, we've seen the previews before and said "that looks good, we should rent that..." Not to mention the fact that I would love (as in L-O-V-E) to have a food truck (its actually my retirement plan), but all that factors aside, it was, without a doubt, one of the best movies I have ever seen. Sure, it's not a blockbuster as in Star Wars of Lord of the Rings, but the plot and acting were really top notch;devoid of the obligatory elements that drive most movie plots. The whole movie just flowed and when it was over, it seemed to end abruptly yet, was complete; it didn't leave you wanting more. Now, we always have to joke when it comes to John Leguizamo on account of the trainwreck of a movie that is "Where God Left His Shoes" but he was made for this supportimg yet vital role, and with cameos by RDJ, Dustin Hoffman, and Scarlet Johansen (who looks really good with a little bit of sleeze on her), it was a movie well worth seeing and highly recommended. In fact, I told my wife that it was a movie worth owning. And not just illegally downloading from the interwebs, but actually purchasing legitimately. Her eyes got a little wider and she said, "Wow...."
Seriously? No comments on the movie 'Chef'? This movie totally inspired me to try to make a cubano as in the movie. With a bit of improvisation, some of which involved barbell weights, I managed yo rig up a plancha-esque contraption that presses the sandwhiches well, but is missing the heat of the upper platen. Sure, it's an inconvenience, but am I going to pay a couple hundred dollars for the convenience if NOT having to flip my sandwiches? Na, I have better things to spend my money on. The next time I make it, I promise I'll take pics and post the recipe.